Back button focus changes how the camera operates and is popular among sports, wildlife, press and street photographers. Though it is not only for those kinds of photographers. When back button AF is configured the shutter button no longer activates or drives the focus. The photographer has to press a separate button the back of the camera. This gives the reason for the name “back button focus”. For the EOS 800D pictured above the AE-lock button with the * icon is the button you press for focus. EOS 800D/rebel T7i and EOS 200D/Rebel SL2 both have a new style of menus, and it seems that some people are not readily finding the desired settings for back button focus. Similar to previous generations of entry level EOS cameras, the setting is in the custom functions C.Fn. It’s C.Fn 12 for the EOS 800D, and C.Fn 8 for the EOS 200D. 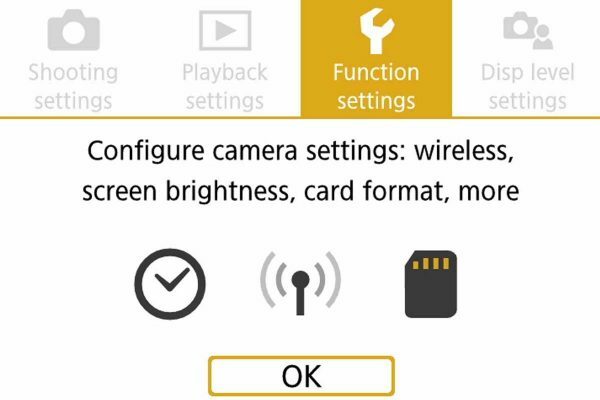 Press the Menu button and then tap on the LCD screen to select the yellow tab labelled Function settings once in the menu, select the last tab and navigate to the custom functions C.Fn. Custom function 12 has four possible settings. If you set it to 0 (the default) or 2, then half pressure on the shutter button determines when the camera will focus. For back button focus you need to select 1: AE lock/AF or 3: AF/AF lock, no AE lock to enable back button focus. When set to 1: AE lock/AF you have back button AF. However the shutter button now locks the exposure when half pressed. This means that if you take a sequence of frames in continuous drive mode, then each will have the same exposure as the first frame. When set to 3: AE/AF, no AE lock, then the camera will focus with the back button, but he shutter button won’t lock the exposure at all. So if you shoot a sequence of images using continuous drive mode, then each one may have different exposure settings. Whether you choose option 1, or 3, you have back button focus. Only you can decide if you need the exposure lock or not. EOS 200D is a small little thing, and whilst back button focus is possible to set, the AE-lock button is not ideally placed for most peoples fingers. So the EOS 200D has an additional customisation that helps if you want to use back button AF. Firstly you set the back button AF much the same as the EOS 800D above, but it is C.Fn 8 on the EOS 200D. The options work in the same way as the EOS 800D. If you set C.Fn 8 to 1 or 3, then the AE-lock button with the * icon must be pressed to initiate focus. Even my short thumb finds this hard to do. Navigate the to the third tab of the set up menu’s and you see the third option which allows you to switch round the functions of the AE-lock button and the AF selection button. I do switch them round on my camera. As a result the back button focus is now activated by pressing the AF selection button, this is a more natural placement for my thumb. If you are a back button focus user, there is limited, or no need to change between ONE-SHOT and AI SERVO AF. For tracking moving subjects, you press and hold down the back button, and the camera tracks your subject with AI SERVO. You take photos when needed by pressing the shutter. For static subjects, keep AI Servo focus set. Press the back button to focus on the subject, and then release the back button so that the camera won’t refocus. You can now freely recompose the shot, and press the shutter to take the picture. In effect you are able to use AI Servo focus for static subjects and still focus, lock (or more accurately don’t refocus) and recompose. If you are confused about Canon EOS focus modes, please read “Choosing the right focus mode for your subject“.